TellMyCell's SMS Marketing service makes bulk text messaging fast, easy and affordable. Our web-based software app offers industry-leading ease-of use, features and pricing. Upload contacts, create unlimited groups, use web widgets and Facebook widgets, even send messages from your own phone. When you want to send out a mass SMS, just select your groups, type your message, and hit send. We do the rest. Text Messaging is the most powerful form of mobile marketing. Messages are short, consumers open over 95% of them, and they can reach nearly every cell phone customer in the US. TellMyCell organizes your contacts by source - Keyword Opt-In, Web Widget & Upload. You can sort your contacts into unlimited groups. Add one contact to many groups. Quickly move, add info to, opt out and delete contacts. Your contacts are yours. You can download them whenever you want...and we'll never sell, rent, or use your contact lists, period. 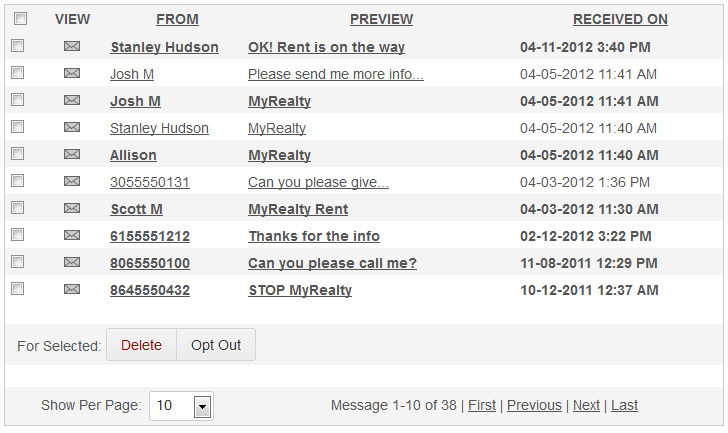 TellMyCell allows you to quickly upload or paste the phone numbers of previously opted-in contacts with a few clicks. Assign the contacts to a group, and we'll do the rest - weeding out duplicates, determining the country, and determining the correct network. 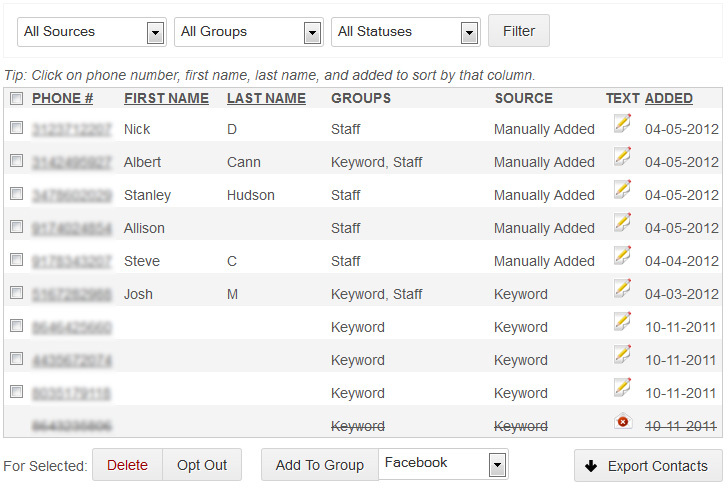 Sending text messages to 10 people or 10,000 people is simple: Choose your group(s), type your text. Send it. Planning ahead? Schedule your message to go out later. Keywords are a great tool that allows your customers or group members to join your group text messaging contact list from their own mobile phones. We also offer unlimited Sub-Keywords which allow you to deliver different information per Sub-Keyword. People quickly and easily opt in to your group text messaging list by texting your chosen keyword to your assigned short code. In the above image, 2For1 is the Keyword. 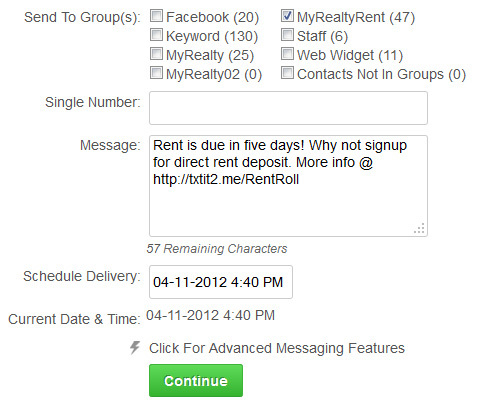 The person will then receive an automated reply message that you can easily customize. This message confirms their subscription to your group messaging list. Please Note: This auto-response message is mandatory. With a keyword, you can also take advantage of our Send-From-Phone feature. From your personal phone, simply send [keyword + your message] to our short code and every contact in the connected group will receive your text message. 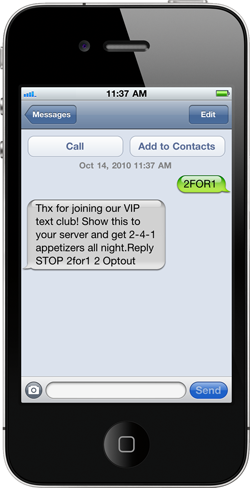 When your customers text your Keyword to our short code we deliver that message to your Inbox. Your customers can continue to text you after they've joined your list by texting in your Keyword. Can't login to your TellMyCell account? No problem - we can forward your incoming messages to your email account or your own mobile phone. Want to analyze your messages or simply back them up? Download your Inbox with a single click. Check the Reports tab in your account to view statistics about your incoming and outgoing message volume, subscriber growth and more. 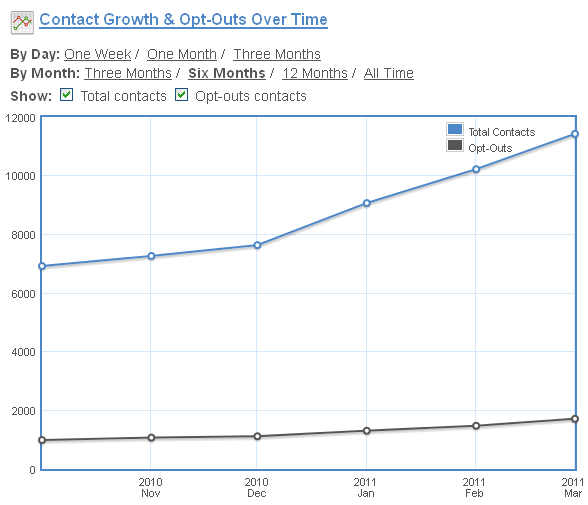 See which messages worked and which messages resulted in opt-outs. Use our campaign reports to review, learn and optimize your text message marketing campaigns.